S Thistlethwaite Plumbing & Heating - Central Heating Engineer, Plumber based in Bognor Regis, West Sussex. My name is Simon Thistlethwaite - Welcome to my page. I am a Gas Safe Registered Engineer with City & Guilds qualifications in Plumbing & Mechanical Engineering I am a dedicated multi-skilled operative with a great work ethic. I began self-employment in 2003 then took a five year break in 2009 to start a new role as a Repairs Team Leader for a large housing association dealing with repairs and maintenance in domestic properties. I have successfully trained and managed teams of plumbers to deliver quality repairs and new installations to tenants with both general and special needs. 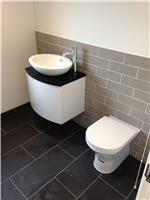 I am also skilled in bathroom installations Luxury and mobility / disability and carry out all my work to a very high standard offering a 12 month warranty on all completed jobs. I have now returned to self-employment to continue with my own business with some new skills and a lot of knowledge about domestic property Installation, repair and maintenance. I am very specific about my work and I offer a Friendly, Reliable, Helpful and Trustworthy service. Please use me with confidence.